Can you do wine in Sweden? Yes we can! When I talk about Swedish wine I mean wine made from grapes grown in vineyards in Sweden. There are also a few producers that do grow vines in greenhouses and then there are some wineries that make wine from grape juice purchased from other countries. Among the latter there are several that produce cheap bag-in-box wines, but there are also some that are more ambitious for example Högberga Vinfabrik AB (wine factory) at Lidingö in Stockholm. EU wine legislation is based on the principle that each country adopts rules for wine classification adapted to protected designations of origin and quality levels. Sweden has not introduced any classification rules, therefore, the Swedish wines can only be sold as table wine. Today there are about 200-250 growers, of whom about 40 works commercially, here is a list with most of them. There is at least 30-50 hectares of vineyards in Sweden, some says that they are closer to 100, where of about 20-30 hectares are commercial. 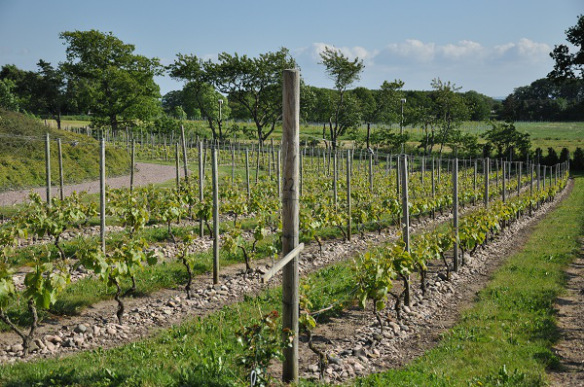 Most of the vineyards are situated in the southern parts of Sweden, in Scania and on the islands Öland and Gotland in the Baltic Sea. But there are also growers in Halland, Västergötland, Östergötland and Sörmland. Last year I visited one of these wineries, Villa Mathilda. It is situated on the Kulla Peninsula at Arild, just north of Höganäs in Scania. 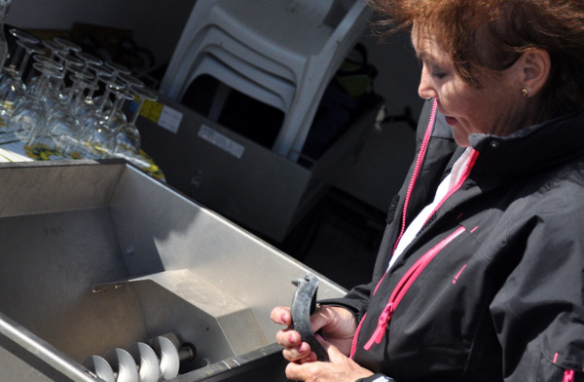 The winery was founded in 2006 and is run by Marie-Louise and Carl-Magnus Hedin, the name of the winery comes from Marie-Louise grandmother Mathilda. The first harvest was brought in 2010, the same year they produced thier first wine. 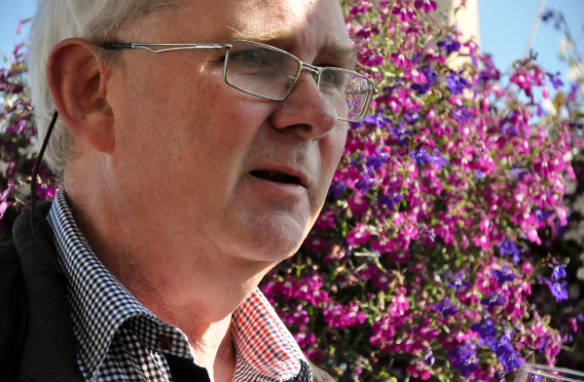 As I am about to taste one of their 2013 vintage wines I contacted Carl-Magnus Hedin of Villa Mathilda and asked a few questions about the vineyard, the winery and the 2013 vintage. 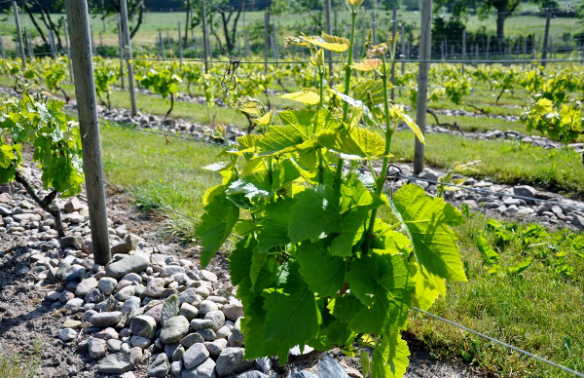 The vineyard consists of a total of 1000 vines, where they grow solaris and siegerrebe. The soil is clay mixed with a sandy moraine on top of bedrock with some sandstone and shale. During a good year they do thier harvested in late September and in tougher years in October. 2012 was a tough year and they harvested October 3-10th. Last years harvest was slightly earlier, on September 27-28th they harvested the sigerrebe and on October 3-4th they harvested the solaris. 2013 was the best year so far for Villa Mathilda, then again 2012 was one of the most difficult. From the 1000 vines they only got 150 kg of grapes in 2012, in 2013 they got 850 kg. In bottles this means about 700 (50 cl) in 2013. Carl-Magnus Hedin told me that they try to raise the bar every year, but they also like to experiment a bit. This year they worked a lot harder in the vineyard during the winter and during harvest they saved some grapes to try a late harvest. While the work in the vineyard has done wonders the late harvest didn’t do much for the grapes. Over the years thay have alos tried different types of yeast. At Villa Mathilda all grapes are destemmed before they are pressed. They pressed with a hydro-press, using low pressure, the wine is unfiltered and they use a selected German yeast that rewards a slow fermentation at temperatures around 12-15 ° Celsius. They also did some changes in the vinification. In 2012 the wine was macerated for about 1 day and for the 2013 the wine has been on sur lie for a longer time and whilst they did battonage. The fermentation is stopped by cold temperature, but they do use some sulfur, maximum 50 milligrams, if needed. When I visited them last year I got to try their 2012 vintage. 2012 was a difficult year and you could taste that in the wines. The Solaris 2012 was a bit unbalanced with a high, a bit sharp acidity that tended to take over. It was the first year for their siegerrebe, a wine that gave a more aromatic and full-bodied impression and had some nice aromatics. A wine that flirts with Gewurtztraminer and a dry zibbio (muscat), last year this worked better than the solaris. Solaris is a grape that is a crossing of Merzling (which in turn is a cross of Seyve-Villard, Riesling and Pinot Gris) and the grape Gm 6493, which is a cross of Zarya Severa and Muscat Ottonel (in some texts it says that is a a crossing of Saperavi severny and muscat ottonel). Solaris is a vitis vinifera grape, but is sometimes described as a hybrid grape due to its many different parents. 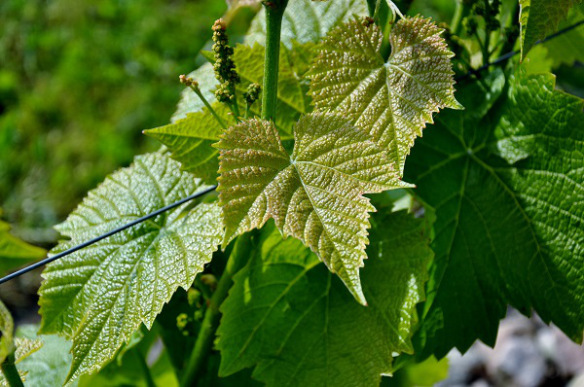 Solaris is perhaps the most common grape in Sweden right now, at least for white wines, the grape gives wines with high acidity and lightly floral aromatic appropriations that to some extent resembles sauvignon blanc. Siegerrebe is also a vitis vinifera grape, a cross of Madeleine Angevine and Gewurtztraminer. The only one I’ve tasted is the Villa Mathilda 2012 so my references are rather thin: this was flowery, aromatic with hints of citrus (many others describe grapefruit in wines made by siegerrebe) and some elderberries. It had significantly lower acidity, more fruit sweetness and more body than the solaris grape wines I’ve tried. The wine reminds me most of Gewürztraminer or a dry muscat/zibbibo wine. Carl-Magnus Hedin tells me that one of the pleasant suprises this year is the siegerrebe, it does so well. That hasn’t always been the case but now they learned how to work with it. A few years ago they were on the verge of replacing it – they didn’t – thankfully. 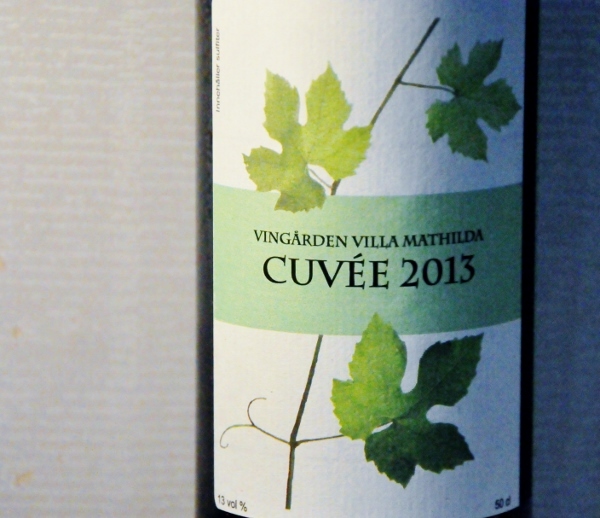 Today’s wine is a blend of these two grapes; Villa Mathilda cuvée 2013. They wanted to play withe acidity of the solaris and the slightly sweeter and richer features of the siegerrebe.The blend is 2/3 solaris and 1/3 sigerrebe, the alcohol is 13 vol % the acidity is 7,5 g/l. This wine is fresh, spicy and clearly aromatic with hints of fennel and wet stone. There is a nice sweetness with hints of dried flowers and elderberry, a hint of citrus and some tropical fruit. It is well balanced with a medium body and fairly long spicy aftertaste. It is fresh, flavorful, austere with some complexity. It is a really nice wine that would perhaps best be compare with a dry zibbibo (ie Muscat di Alexandria) with hints towards scheurebe, pinot gris and gewürzttraminer. I would pair this wine with seafood, Asian food that does not have too much heat or cheese. I asked Carl-Magnus Hedin about the current vintage, he says it looks really good. They are a few weeks ahead of 2013 that was really good, they plan to do the harvest during the las week of September and the vintage has great possibilities to be as good as 2013 or better. This might not only be due to the vintage in itself but they have also continued to try to become better in thier work in the vineyard and the winery. 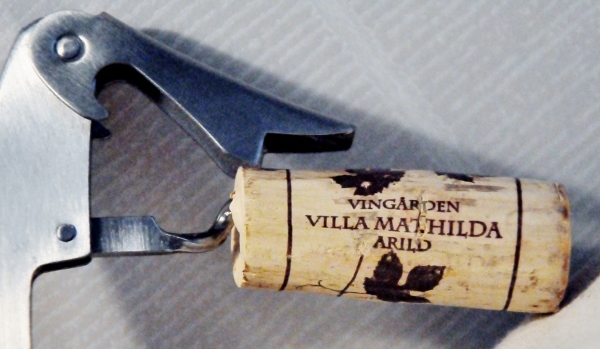 I look forward to 2014 and many more vintages – if you want to taste a good example of Swedish wine – Villa Mathilda is very good way to go – and even better they are #winelover-s! If you want to taste it about 10 local resturants have it and a really good resturant in Gothenburg: Sjömagasinet.